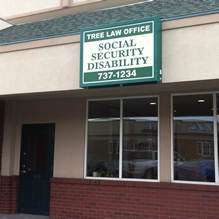 Due to hard work and successful results for its Social Security Disability clients Tree Law Office has experienced a large growth in Benton, Franklin, and Walla Walla counties. In order to better serve these clients Tree Law has opened a new office in Kennewick. Our current and future clients in these counties will be serviced at our new office. Our new address is 8390 W Gage Blvd STE 104, Kennewick, WA 99336. You may call us in the Tri-Cities at 509 737-1234 or toll free 1-800-704-3699. We do not advertise on TV, radio or newspapers. We devote our full attention to representing the disabled in their claims for Social Security Benefits. We rely on referrals from satisfied clients to grow our practice. We appreciate the many thousands of clients we have assisted in obtaining their Social Security Benefits and plan on continuing this same type of representations for our new clients throughout Central Washington. Look forward to meeting Allison and Justin.